Lompoc resident Archie Mitchell has done a lot of things in life. To name a few: He retired as a chief master sergeant (the highest enlisted rank in the Air Force), started a boxing club, and worked as a newspaper reporter. Now, it’s all about the bees. 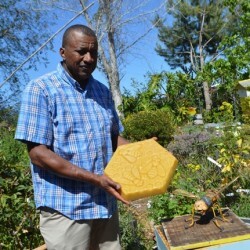 He serves as regional director for the Western Apiculture Society, the director of the Lompoc Valley Beekeepers Association, and runs Lompoc Honey, a small cottage business selling honey, beeswax, and beehive removal services. Part hobbyist, part entrepreneur, Mitchell’s well practiced in the art of modern apiculture, or beekeeping. Overlapping a distinguished career traveling the world over as an intelligence analyst in the U.S. Air Force, Mitchell moonlighted as a beekeeper for three decades. Mitchell’s proud of his military service, but he holds a special place in his heart for bees. “I had a thoroughly rewarding time in the service, but not as rewarding as a beekeeper,” Mitchell said. And there’s a reason for this. Mitchell said he has a direct impact on crop production through bee pollination. Beekeeping’s been around for thousands of years and is considered an essential part of producing the country’s food supply. U.S. Department of Agriculture Secretary Tom Vilsack estimated last year that $15 billion of the country’s agricultural production depends on bee pollination and announced $11 million in financial assistance to upper Midwest farmers and ranchers interested in maintaining beehives. And then there’s the honey, of course. Marketed as wildflower honey, Mitchell’s product is actually made from several varieties of flowering plants and collected from various sites around the county, including the Lompoc Valley. Three pounds of Mitchell’s honey runs $22.50, or $12 for a pound and a half. Smaller vials of honey are also available. His products can be found on the web at lompochoney.com. The honey is as local as you can get, and Mitchell said it sure beats the imitation stuff floating around in some stores. 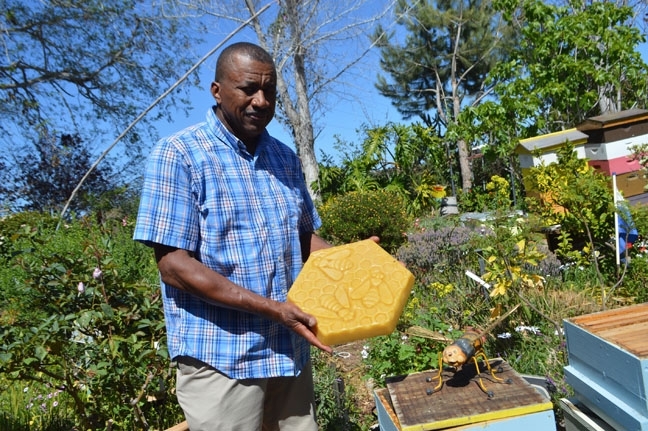 Mitchell also sells bees to other beekeepers and professionally removes unwanted beehives as a part of his services. The presence of a wild beehive can pose a precious, if not deadly, situation to some. But don’t be so fast to dial pest control, according to Mitchell. “They shouldn’t be calling an exterminator; they should call a beekeeper,” Mitchell said. He doesn’t kill the unwanted colony: Mitchell either incorporates it into his own collection or trades it with a fellow beekeeper. Considering the role bees play in the world’s ecosystem, Mitchell dutifully disseminates the word on why he thinks bees are important. Bees are disappearing, and no one seems to know where to or why. The phenomenon is known as colony collapse disorder (CCD), whereby entire bee colonies abruptly and mysteriously disappear from their hives, is leaving beekeepers like Mitchell on edge. The causes for CCD are not known, although Mitchell believes that part of the problem comes from widely used commercial pesticides. But there is at least one solution, and that’s to build and maintain a beehive. Mitchell said it’s not hard, and anyone can do it. He’s teaching a four-week intermediate beekeeping course starting April 4 at the Allan Hancock College Solvang Center, 320 Alisal Road in the Solvang Village Square. The cost is $72, and the course teaches students how to establish a beehive and recognize instinctive behaviors of bees. 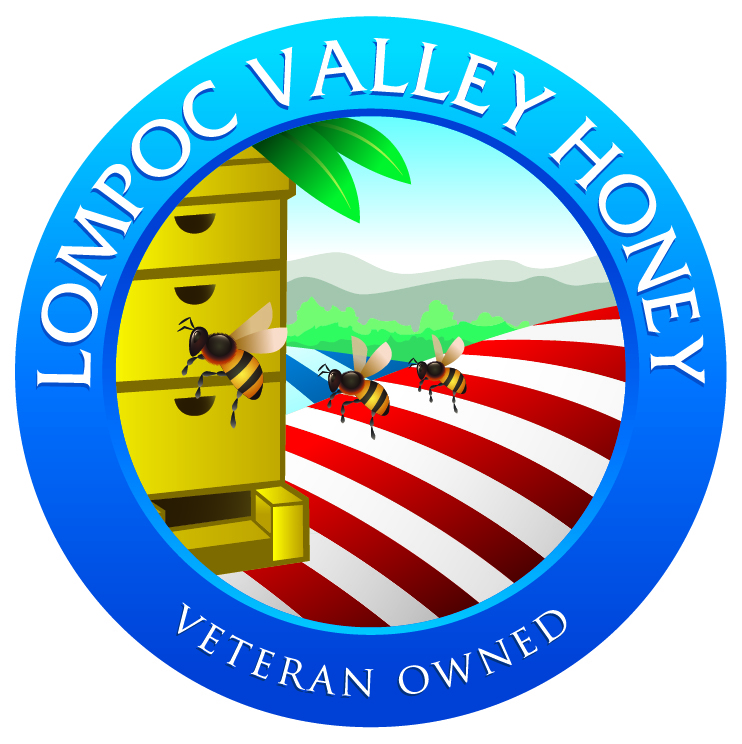 For more information about Lompoc Honey, call 291-8279. Online enrollment for Mitchell’s Hancock beekeeping class is available at hancockcollege.edu. • The San Luis Obispo chapter of SCORE, a business mentoring nonprofit, is holding a Start Your Own Business workshop at MIYB Spaces in Santa Maria on April 9 at 9:30 a.m. The workshop is free and covers basics such as developing business plans and understanding financial reports. Register for the workshop at sanluisobispo.score.org. MIYB Spaces is located at 429 E. Main Street. Call 623-8434 for more information. • The Santa Maria Public Library is offering a free workshop on e-readers at the Guadalupe Branch Library on April 14 between 3:30 and 5:30 p.m. The workshop covers how to download eBooks and digital audio books onto portable devices, such as iPads and Kindles. Pre-registration began on March 30 and space is limited to a first-come, first-served basis. For more information, call 925-0994, Ext. 331. Staff Writer David Minsky wrote this week’s Biz Spotlight. Information should be sent to the Sun via fax, email, or mail.